The Perfect Alternative to the Candy Bar or Cookie Fundraiser has Arrived; Say, Hello to Canned Drinking Water from CannedWater4kids (CW4K). When used as a fundraiser, we see our canned drinking water sales as kids helping kids. Each sale provides funds for groups doing the fundraising as well as funds that support clean drinking water projects worldwide. CannedWater4kids.org (CW4K) offers one of those special items – canned drinking water. Each sale provides funds for groups doing the fundraising as well as funds that support clean drinking water projects worldwide. “Water Wednesdays” became a weekly fundraising event where the school sold CW4K canned drinking water during lunch on Wednesdays during the second half of the school year. After each lunch, students had the opportunity to collect and save the empty cans for recycling. Not only was this good for the environment, but it also provided an opportunity for the school to raise even more money. 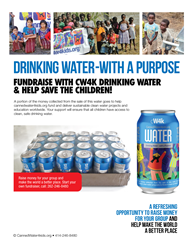 CW4K canned drinking water could be the fundraising program that so many clubs and organizations have been waiting for. Call CannedWater4kids today at 262-246-8480 and see what CW4K can do for you. CannedWater4Kids is a 501c3 charity based in Sussex, WI. The organization’s purpose is to ensure all children have access to clean, safe drinking water. CW4K funds its initiatives with cash donations, grants and through the sale of their premium drinking water in aluminum cans and bottles. 95 cents of every dollar collected goes to support clean water programs. Projects include assisting the University of Wisconsin – Milwaukee’s Engineers Without Borders in bringing sustainable water purification solutions to the highlands of Guatemala, and support for well/water tank and Bio Sand Filter projects in Zambia, Kenya, and Tanzania, Africa. Recent disaster and hurricane –relief efforts include the sending of truckloads of canned drinking water to Michigan, Texas, Florida and Puerto Rico. To learn more, visit http://www.cannedwater4kids.org/howtohelp. Swanson Elementary is located in Brookfield, WI and is part of the Elmbrook School District. The school follows a “PEACE” model – promoting peace, empathy, and compassion everywhere with the goal of creating an overall climate that is comfortable, happy, safe and productive for all learners. Staff members are known for their providing of individual support to each student based on their unique skills and needs. Specialized programs & services offered include: Math & Reading Learning Support, English Language Learners Program, Physical & Occupational Therapy, Special Education Services as well as a Gifted & Talented Program.